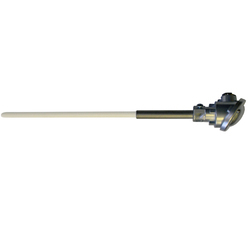 Molten Metal Thermocouples are specially designed to withstand the corrosive & temperatures action of molten metal media. - LCLS steel casing for inner-wire protection. - Special SS Thermocouple with accurate sensing. Being one of the eminent names of the industry, we are involved in manufacturing, supplying and trading Metal Thermocouples for Electric Industry. Offered products are made using quality material and are well recognized for durability as well as enhanced performance. - Enclosure : AI.W.P. / AI.F.P. We are a unique entity in the industry, actively committed towards manufacturing a qualitative range of Metal Thermocouple. 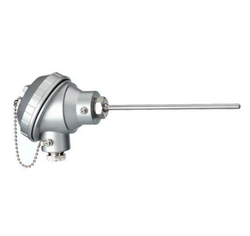 Our company holds immense experience in this domain and is involved in offering wide assortment of Type S Thermocouple. Banking on the skills of our qualified team of professionals, we are instrumental in offering a supreme quality range of Metal Sheathed Thermocouple. - Large gauge bare alloy available with ceramic insulated elements and protection tubes. - Available in ASTM E 230 Types K and J. We are a leading manufacturer, supplier and exporter of Base Metal Thermocouple. Keeping in mind the ever-evolving needs of our clients, we are devoted towards offering an optimum quality array of Platinum Thermocouple.